Make your college life easy so you can be the most productive student possible. Organization skills are imperative when starting at a new college. The best ways for college students to stay organized are often obvious, but so easily forgotten. Keep in mind, organization can help keep everything in order can give you more energy and better sleep habits. 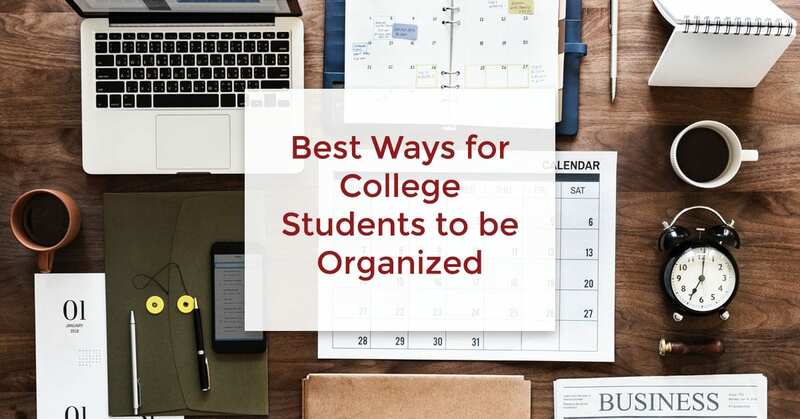 There are many ways to not be all over the place, but these are the best ways for college students to stay organized. First things first, get a planner. There are so many different topics to learn, and everyone has a busy schedule that it can be overwhelming at times. With multiple planners and a color-coded system, it will help you allocate your time properly. Color-code all of your folders and just grab the colored folders you need for the day in your planner. Don’t be afraid to have more than one planner. Having a class planner and a social planner will help you keep your priorities in line. You can even keep a whiteboard in your room for things you want to see as a reminder when you wake up. One of the most important ways to keep your study time planned out throughout your college experience is to create a spreadsheet. It’s a way to organize your class assignments and consolidate them into a single sheet. It can be used to stay on top of deadlines, and it creates excellent study habits for your entire time as a student. Another great way to survive the crazy workload that you will be tackling is simple: be effective. It’s all about keeping your laptop organized. When attending college, you may receive emails about the course or have events scheduled such as webinars. One way to keep every assignment and email for everything all together nicely on your laptop is to create a separate folder for just your college-related topics. In that one folder, you can create subfolders for different topics or classes. That way you know which folder to look for quickly. Keeping your laptop less cluttered can increase your productivity. You will save time not having to spend half an hour looking for things and have more time to work on essential tasks. One of the final pieces of advice for college students to stay organized is preparation. It may seem silly, but it won’t be that one night you wake up late for your scheduled appointment or class the next day. You may be late, but it will make all the difference if you are at least prepared. Imagine, you leave to go out and study in a coffee shop for the day, you grab your laptop bag, get your coffee, and sit down to start working. When you open you laptop bag, and there is no laptop. All of that can be avoided with preparation skills. Like making sure you pack your bag the night before. Or, keeping all of your school supplies together. A nice trick you keep all your small items together is to use a pencil bag. In that one bag, you can store pens, pencils, a stapler, USB drives, highlighters, and post it notes. You’re also going to want to bring a phone charger with you for the day. A neat trick is to get binder clips to keep your laptop charger and phone charger together in your bag so it’s not getting tangled up and you won’t ever need to run back to your dorm room. So, there you have it. These are some of the best ways to stay organized throughout your college life. A few good planners to keep you on track. Having that college spreadsheet will keep you ahead. Let’s not forget having organization skills for your laptop and preparing for when those sleepless nights arise. Follow these tips to stay organized, and college will be a breeze.